Taken in May in Salt Lake City at the conferencecenter. I had originally taken this for the Lines challenge. Haven't figured out what this has to do with transportation? 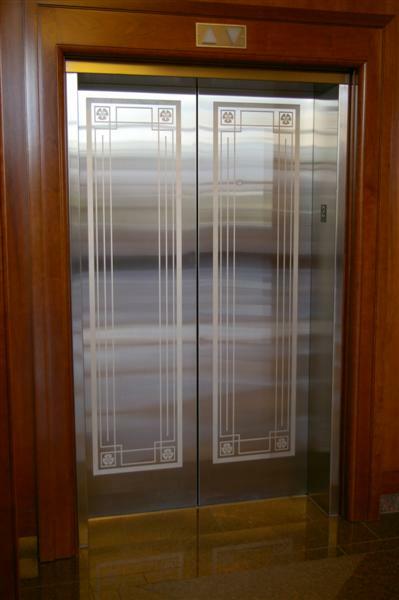 Elevators are actually the most commonly used for of transportation in the country. Sorry. I figured people would know what it was. A people transporter - an elevator. a. The act or an instance of transporting. b. The state of being transported. 2. A means of conveyance. 3. The business of conveying passengers or goods. 4. A charge for public conveyance; fare. 5. Deportation to a penal colony. Nice shot of the elevator. You have to remember that Selvin, being a native of Hawaii, may not be familiar with this form of transportation. I'll relate my experiences toyou on this photo. I looked at the design elements on the doors., the surrounding lintel, the reflections in the glass, etc. Mea culpa, mea culpa, it's defnitely a mode of transportation. Thanks for posting the definition. I'd been wondering why this excellentChallenge wasn't called plain, simple "Transport". It's the style worldwide now in English to add impressive syllables. We still have some way to go to reach "uptransportificationisationator" instead of "lift", fortunately. No problem, Selvin. I guess I know what it was since I was there! It's actually stainless steel doors. I had wanted a shot straight on, but it was so shiny you would have seen my reflection in the doors. I wish I'd had a photo of the glass elevators in the hotel in San Francisco on the Embarcadero. I think it's the Hyatt Regency. The elevators are all inside and the building slopes inward to a point at the top. At least that's what I remember from 30 years ago.